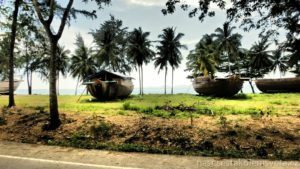 From Koh Tao, Koh Phangan a Koh Samui islands we journey towards the Andaman sea to visit Krabi. Boat and bus transport cost 500 THB/person (cca 14.30 USD). To get to our accommodation in Krabi we used local transport called songthaew. We stayed in Raya Guesthouse for 400 THB/night (cca 11.45 USD) and we can truly recommend everyone to book this hotel. Opposite the hotel we rented a motorbike from a Thai woman for 150 THB/day (cca 4.30 USD). She did not ask for passport nor a deposit. We stayed in the calm part of Krabi but were located pretty close to a small food market, convenience store and to an amazing beach. Nopparat Thara beach at Ao Nang summer resort in Krabi is less touristy and more tranquil beach. But still has a lot to offer. It is situated directly in the national park and there is one really cool thing, you can swim to a small islet nearby. Privacy is guaranteed there. We were even able to walk there through the water because the sea was not that deep. We only missed our favourite cocktail drink there. 🙂 We hunkered down the shore and admired the place. 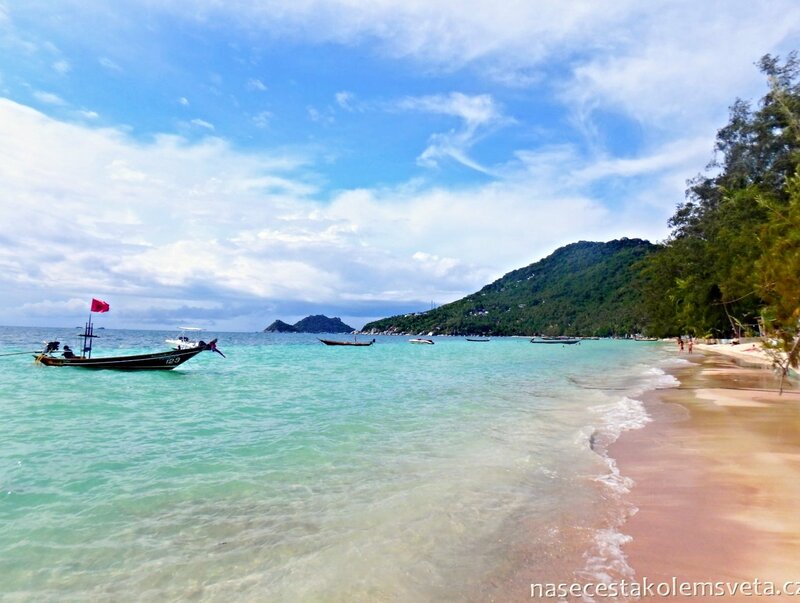 But Krabi is famous for other beaches. Some of them are more touristy and overcrowded like Railay Beach. 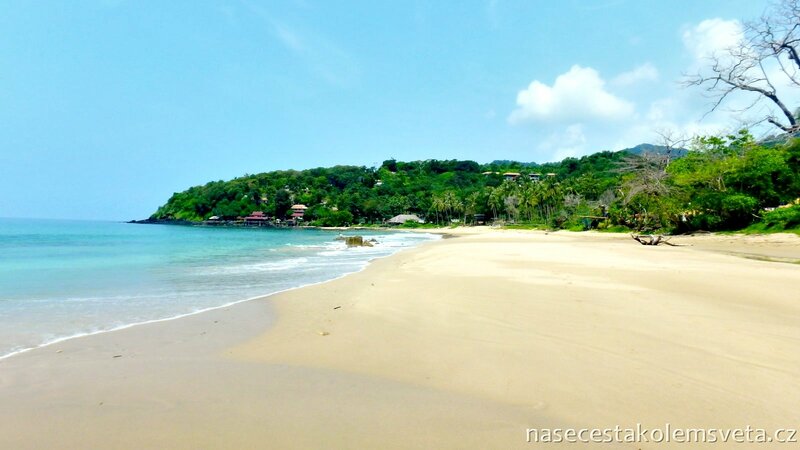 Some of them are less crowded and show you national heritage of Thailand like Fossil Shell Beach. 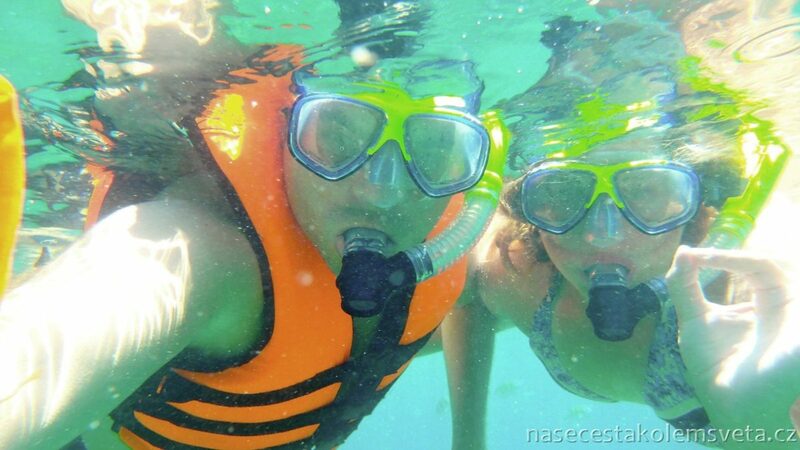 We wanted to get to know some other places and enjoy swimming therefore we set out for couple of excursions. Holidays in Thailand in Krabi is a great choice. It is not because there are still places with relevant peace but it is very easy to move around and explore the surroundings. 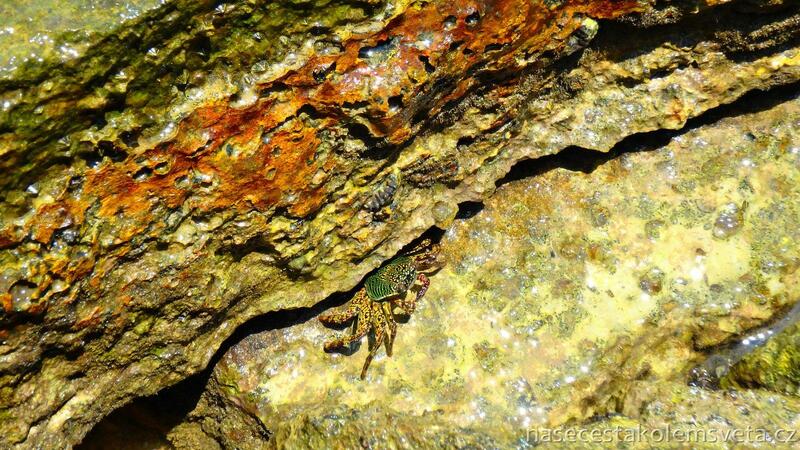 Among the most famous tours in Krabi belongs 4 island excursion. We liked it so we went for a day trip and chose to enjoy it on a classic lon tail boat. 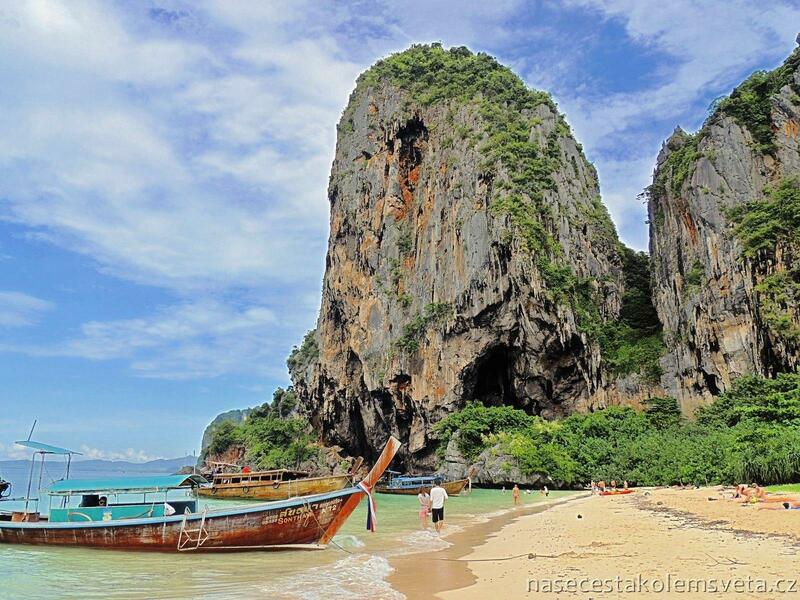 First we visited Phra Nang Cave Beach at the Railay peninsula. It is a place of pilgramage and Thai people love to visit in order to pray there. It was a very overcrowded place but with possibility to buy a refreshments straight from the boats. 🙂 After a short walk a picture shooting of the high limestone rocks poking out of the sea we sailed towards the Chicken Island where we snorkeled. We jumped out of the boat to the sea. Spotted a snake in the water but let’s be honest about the corals – they are dead in Thailand. 🙁 It was something we could not change therefore we enjoyed the presence of fish and there were so many of them. The name of the island derives from a shape of its rocks that remind of chicken. Nex stop was Mur Island (Koh Mor) and a place called Twin Sea that connecs Mur and Tup Island. And when the sea level is still, it is possible to cross from one to another on a beautiful white sand. We have to admit that the water there was so nice and clear. Amazing spot for a picnic that was part of the 4 islands tour. Out of here we headed towards Poda Island (Koh Poda) where we were enchanted by a very long beach. We walked as far as possible to be there alone. The island have become so popular even for a film industry. There was a crew shooting a new film for Bollywood. Though it may seem that trip around the world is adrenaline experience itself, we do not think so. 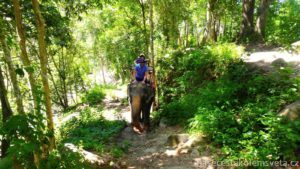 Therefore we tried to experience elephant trekking, rafting (it was adrenaline especially for Martina because she is not very keen on such actions) and zip line in Thailand. We had a blast during the elephant ride and even though elephants were really caring and sensitive we felt sorry for them. We set on the elephant’s neck and when he felt we were falling down he simply hold us with his ears. And we had some space to cuddle it. Then it was time for rafting. It was not that type of dangerous mountain river rafting but it was crazy at some point and there were moments we had to do our best not to jump. In the end we experienced some fun on a short zip line and it was amazing, could do it again and again. It was the whole day trip with transfers and food and possibility to have a bath at the waterfalls. For this excursion and 4 island tour we paid together 1250 THB/person (cca 36 USD). We had to bargain for a while as it is pretty common in Southeast Asia but it is possible to get it for such a great price. We were attracted by Thai countryside and rural areas and our friend Vaclav recommended us to visit Emerald Pool distant cca 70 km from our accommodation in Krabi. Unfortunately we did not know they will ask for such a high entrance fee of 200 THB/person (cca 5.72 USD) but we had to see it. We walked through a beautiful forest and reached the first natural pool and so many people there. We did not really like it but we swam there. 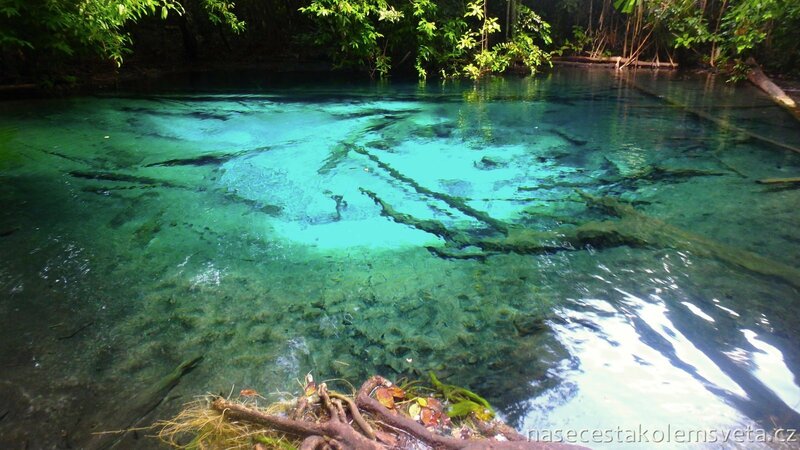 Nevertheless it did not look like cenotes in Mexico at all. Then we decided to go to the well-know Emerald Pool and it looked amazing! Unfortunately it was forbidden to swim there. Never mind we soaked once again on our way back in the first natural pool and then walked the other part of the trail in the woods. Our original plan was to visit local Khlong Thom hot springs because they were located a few minutes from this spot. But the sky became black like a coal and we thought it would be better idea to drive back to Krabi before very heavy rain. 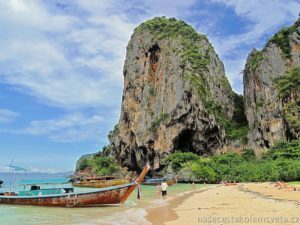 So we would like to emphasize that holidays in Thailand in Krabi is one big amazing adrenaline experience we can recommend to anyone as well as the visit of Koh Lanta and Koh Phi Phi Island where we voyaged afterwards.